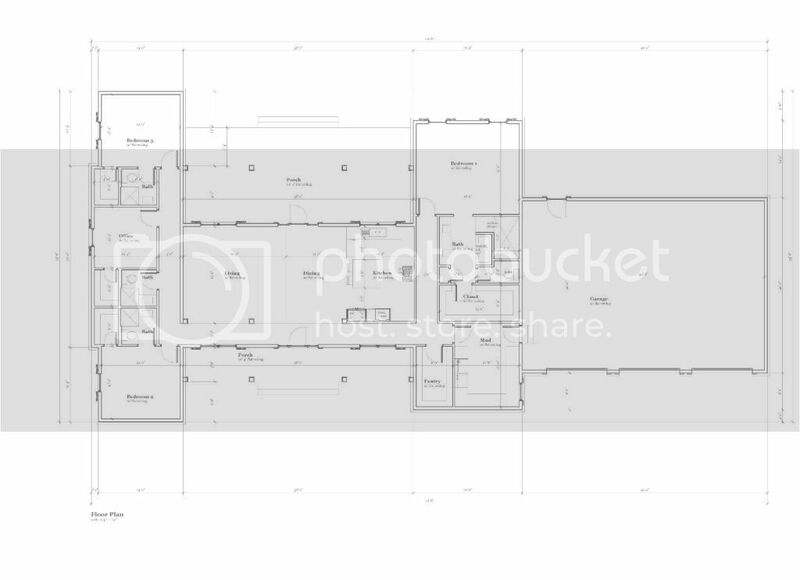 Well, I thought I'd go ahead and post the floor plan and layout to take a look at, as we prepare to start the building process. Our original intent was to do a farmhouse style design, and we really wanted to try to stay with a fairly rectangular shape. With the rooms and layouts that we wanted, it wasn't seeming real feasible. After some sketches and tweaks, we settled in on this design. This keeps our square footage down around where we need it to be for our budget, while giving us the layout and rooms we want. Some of the design in the plans is going to be decided as we go along, like the exact cabinet layouts and some styling features. I'd say 85-90% of what we'll end up with is captured in the drawings. 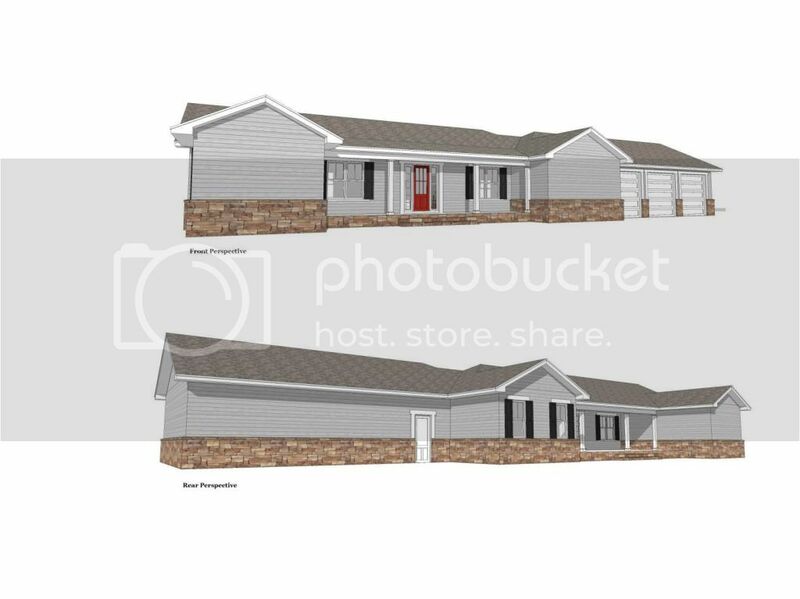 The elevation drawing is representing a generic stone, siding and paint color that will likely change. This first picture is really close to the color scheme and stone we'll do. In addition to the color scheme in the first picture, we are thinking about adding some texture differences where the siding is. Our thought right now is to do board and batten on the faces of the porches, shake shingle type surface in the gable ends and the lap siding everywhere else. Needs at least one rear roll-up door on that garage. Our last house had that and I am contemplating it. When we firm up the bids and make the next step, it will probably be a point of consideration. I think you need some windows in the front of bedroom 2 and your mudroom and/or pantry. Those gabled roofs with nothing under look like something's missing. Of course, if you and your wife like it the way it is, that's all that matters. Also, if you have the room, I might break the garage away at about a 30 degree angle when looking from the front. I think that would look nice to have a circle driveway up front and have the drive to the garage break off to the side. You also wouldn't see so much garage from the front view of the house. Again, just something to consider. If those garage doors are less than 10' wide, consider doing a double and a single. If you ever foresee having to back an 8'6" wide trailer into the garage, you may be screwed. Heck, even with a 10' door (which is less than that after subtracting for molding) can be a little tricky. We tried putting windows in there and just couldn't seem to get it to look right...looked very asymmetrical and through off the whole look of the house. We're toying with a few ideas for those surfaces to see if we can get it to look not so empty. You're thinking making the garage detached and spreading it out, then put it at the angle? We definitely have plenty of room to do just about anything. Our property is a little over 360' wide. No, still attached, but making it hit the rest of the house at an angle. I'll try to find a picture. I think this is what ohsix is talking about. I would do the driveway differently, but otherwise, yes. I agree with ohsix, the lack of windows under the gables on the front definitely looks like something is missing. It looks like the biggest challenge to get the windows right would be due to the pantry/mud room area. The look of that gable could be changed significantly or entirely removed by adding the angled garage. The other gable looks like you could easily add a centered window. Angled garages do add a small bit of complexity to the roofing and trusses, but it shouldn't be that bad. Okie Boarder: Will the garage be seen from the road? I'm not a fan of everyone driving by and seeing all my tools and toys in the garage. Gives thieves a preview of what they'd get if they decide to hit my house. Are you going to have an outbuilding on the property for boat/truck storage? It's always nice to have 1 of those 3 bays a little deeper for the boat or a large pickup since the standard depth is always to short for those vehicles. I'll upload an earlier version of the design with windows, so y'all can see it. To maintain the symmetrical look and the farmhouse feel, but still stay within size (and budget) restraints, it seemed like the best option was to move those windows to the side. We've found some good ideas with faux window looks and there are plenty of landscaping options to consider, so we feel we can overcome the way it looks in the elevations. I agree that the lack of windows seems odd, but seems the alternatives were worse. I like the way that angled garage looks...we can look and see if that is feasible without slipping back over budget. boardordie, yes, it will face the "road", but will likely be obscured with landscape. We won't have another building at this point, but that is always a possibility for the future. The garage is going to be 29' deep, so we should be able to accommodate longer items. Here is an earlier iteration of the design with windows on the front gables. 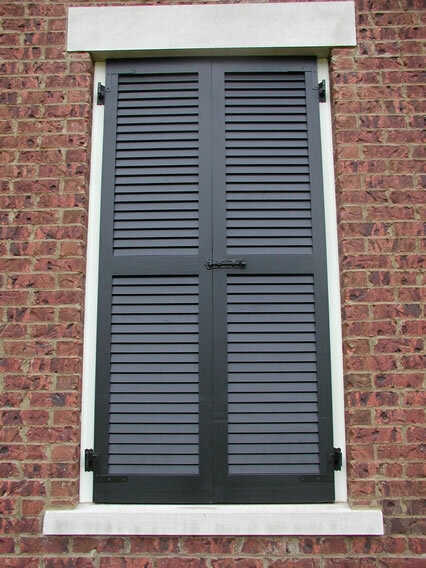 One thought we have is to do the window shutters where they could actually function and be closed, but lock them in the open position. 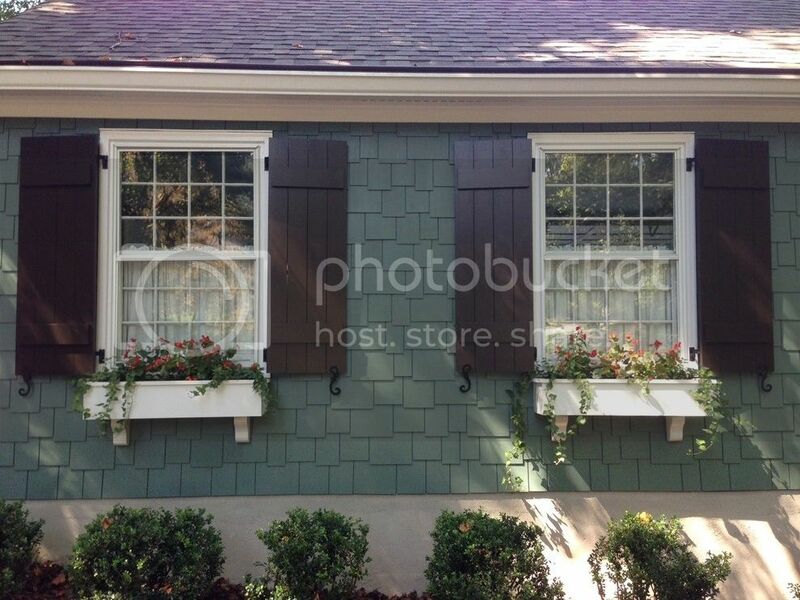 We could then do shutter on the front gables, but make them look closed. I think it's much better with the windows. If you can center the one on the right, that would be best. It looks a little unbalanced with it off center. Without the windows, imho, it looks a little too much like a house in between to storage areas. Also, I like the others input on twisting the garage. That should go a long way and give the house some dimension. With the layout of the mud/laundry and the pantry, it would be tough to center the windows and give that symmetrical look. I think we explored all options, but I'll throw it out there to the architect again. Did you explore the option of shifting that area forward a bit to match the front of the other bedroom and flipping it so the master is in front? Not ideal, but would solve the window issue. Not something I thought about, but I'm sure the architect did. That idea may end up increasing square footage to a point that would be too much, just looking at it. Something to think about, though. This is one idea we had in mind...have all the shutters fully functional and locked open, but show them as closed on the gable walls. Plus one on windows on gable ends. Also consider some windows on the side or rear of garage. The natural light will really help when you are digging through the crap that piles up in a garage for your 9/16 socket. The natural light will really help when you are digging through the crap that piles up in a garage for your 9/16 socket. IMO a garage is a place where there simply will never be enough available light. I've got windows literally next to my workbench and I still want more light. Playing around with siding texture and stone colors a little bit to see what we think. 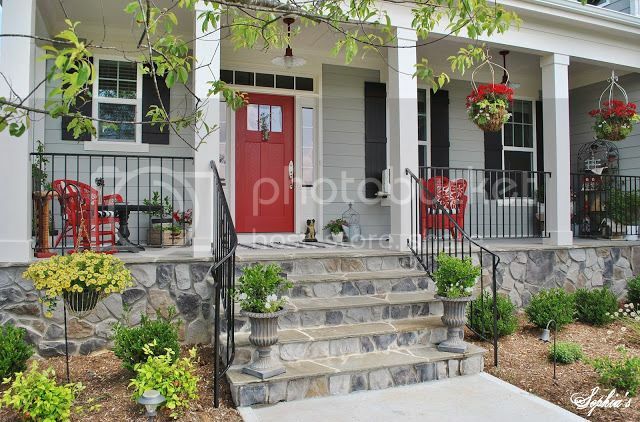 I think we want to find stone that is a bit more colorful, maybe do the garage doors in a black or blackwash look and maybe do some color shade variation on the gable peaks and the porches. 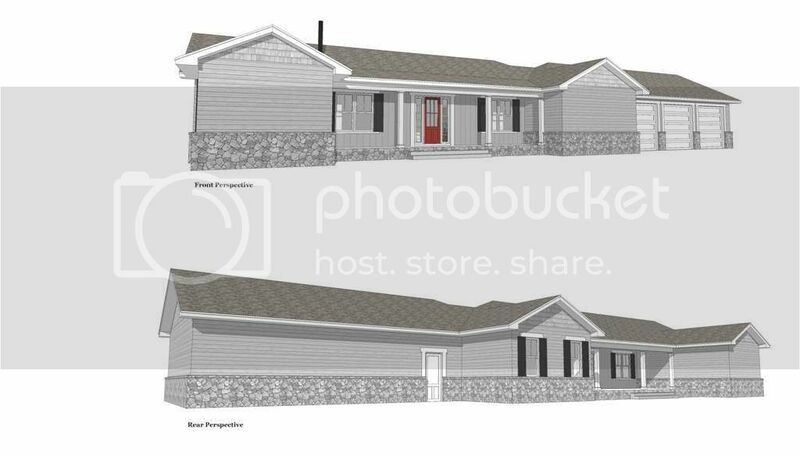 Full plan set is complete and one contractor already bid...waiting for the rest so we can decide who we want to go with. I would look at two single windows symmetrically spaced on the gable walls. I think you will regret not having windows there. The first time you or your wife/kids are in folding laundry and hear someone pulling in the driveway or the doorbell rings your going to say "jeepers, why can't I look out and see who pulled up". Same with the bedroom, your kids will want to be hanging out in their bedroom watching for their friend to show up or come pick them up. I could see that being a possibility and maybe the two window idea would work...a window in the pantry may not be an issue. That could bring up a different concern, in that we would have several windows on the front of the house facing west, so we would have issues with the hot evening summer sun baking those rooms. I think a bigger problem is going to be your garage facing west and those 3 doors soaking up the afternoon sun. I had a west facing garage at my last house and it was about 20 degrees warmer than the ambient temperature before parking hot cars inside. I'm not sure of your lot configuration, but at 360' wide, I would assume you can orient the house however you like. I would think real hard about rotating it 90 degrees. The lot configuration allows that, with a caveat. We have some drainage to the south, so if we rotate the house like that, the driveway has to cross drainage. That could complicate things. Orientation was something I never really thought of before having that west facing garage. My parents have a lakehouse that the back (lake side) faces west. There is a slope down to the lake with about 40 pecan trees on it that block most of the afternoon sun from hitting the house. There are 30-45 minutes before the sun goes down that the sun is under the canopies of the trees that make their backyard, dock, and porch uncomfortably bright and hot. I would definitely spend the money, assuming it will cost a little more, to make the house face north or south. Even if it means sacrificing some other options on the house. Our house faces slightly northwest and I can attest to the hot garage. It's enough where before summer I am going to install an insulation kit on it to help keep it even a tiny bit cooler. Hmmm, may have to think about that one. There would be a lot to consider like the drainage issue and our view out the back of the house. Orienting that direction means we would look to the north and there are a couple houses that direction...not sure we want to look at the back of their property versus looking at our nice wooded area. I would also comment on the long hallways you have to the bedrooms. I am sure the thinking there is the barrier is nice from other areas of house. But, keep in mind access. Example. You are in a rush to get out of the house and you forgot your wallet. down the hall you go, you get to the car, stuff keys are on night stand, down the hall you go. That and you don't make a main room in the house a pathway. There's nothing we dislike more than walking through the middle of the living room to get to a bedroom. I would turn the garage to where the doors open to the side or angular like others have mentioned but I would prefer to the side completely if it was me. Also, as others have mentioned if there are gables I would want windows, even if they are split. The split in the bedroom works well as long as you leave enough space for a dresser or something similar to fit in between. I would want windows on the rear of the back bedroom also under that gable. Definitely make one of the garages a double size door. It makes life so much easier. If you can get it built without a wall between the double and the single that's also a huge help. For me, I would even up the left side / right side front and back. One last thing is it looks like that pantry isn't going to have easy access to the kitchen. You may want to consider a different purpose. Our original idea had them equal, but that ended up being too much square footage for our budget. 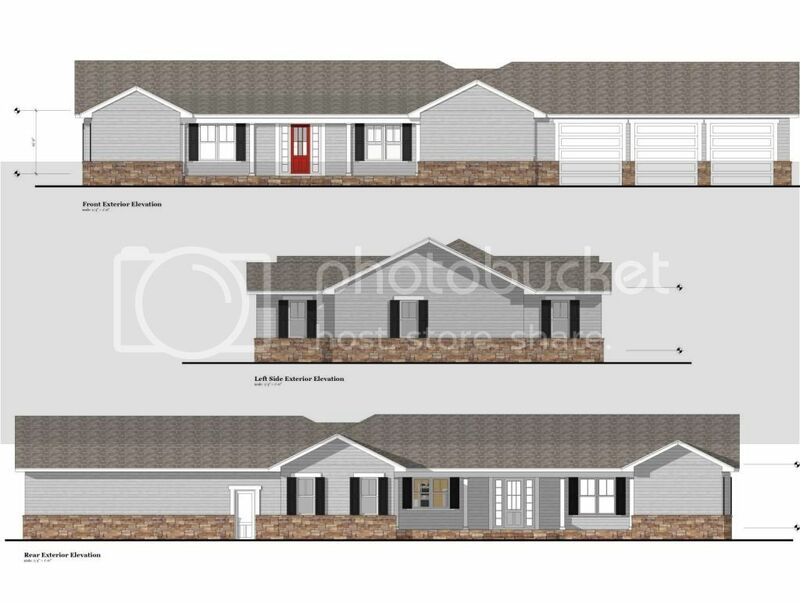 The large pantry is going to be mostly geared toward longer term storage of food and house items, along with appliances that don't get regular use. We will have some in cabinet storage to use as a small pantry in the kitchen itself, probably between the refrigerator and oven. So, we sat down with the contractor last night to finalize and approve plans and make any last minute changes for his bid. During that conversation, we talked about several thoughts on options. Regarding the water heater situation, we spoke in more detail of costs and options. He said that with our 4 bathroom set up and hot water needs, the tankless configuration costs about $1100 in equipment and around $5-6k in additional electrical and plumbing costs. We discussed another alternative to the typical 40 gallon water heater in most houses and that is a smaller tank configured with a recirculator. Have any of you had much experience with this? He's installed them in several houses and said he plans to do the same in his own house whenever his standard water heater decides to go out.